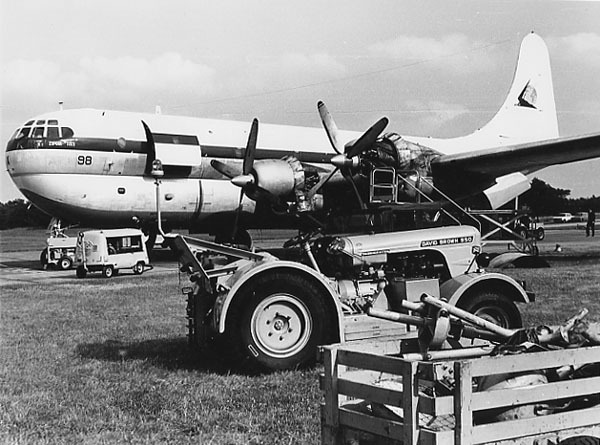 The Boeing model 367 evolved as a cargo/transport derivative from the Boeing B-29, which retained the wings, tail section and engines from the B-29. The B-29 fuselage was changed by adding another fuselage atop the original one, in order to obtain greater volume. Besides, this ‘figure 8’ configuration (the form of the fuselage cross section) was preferred over a larger diameter fuselage as it was found to be stronger and thus could be pressurised safely. The first of the XC-97 flew on 15th November 1944. 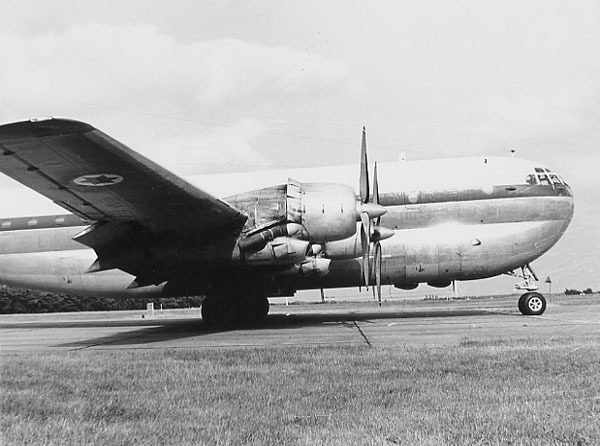 The initial aircraft had the lower type B-29 type tail fin. On the military front numerous models were developed, ranging from straight forward transports to in flight refuellers and command stations. 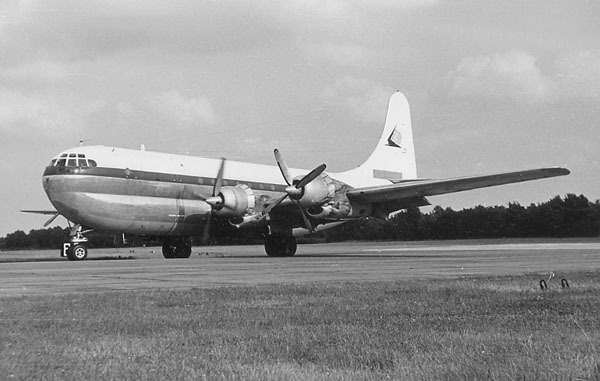 The most numerous model was the KC-97G, of which 592 examples were built. These aircraft were able to refuel aircraft mid-air using both accepted methods of doing so, namely the hose-and-reel system and the flying boom principle. 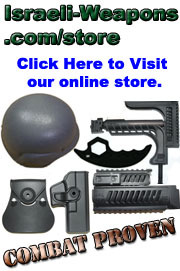 During their career the various models were updated and upgraded. As the C-97 series was being replaced in the U.S. Air Force inventory, the airframes became available to the civil market, after being de-militarized. The eleventh aircraft was completed as the YC-97B and was in fact a luxury personnel transporter. This aircraft formed the basis of a luxury passenger aircraft. 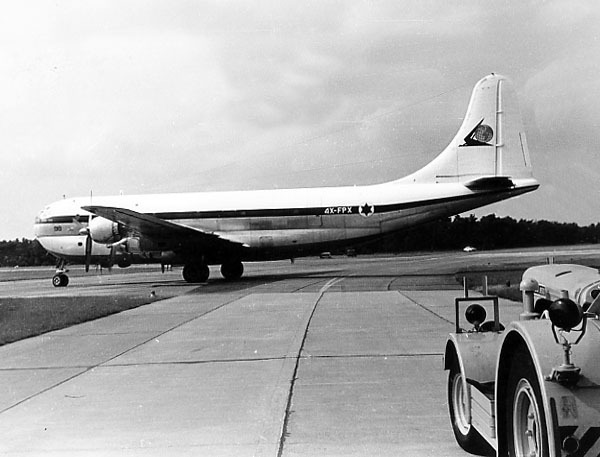 In an effort to capture part of the civilian passenger and cargo market, Boeing developed the Boeing 377 Stratocruiser, by basing it on the aforementioned YC-97B. Its status as an exclusive luxurious airliner at is time ultimately became comparable to the BAC/Aerospatiale Concord during the seventies. Only 56 Boeing 377 Stratocruisers were built, originally ordered by six airlines. 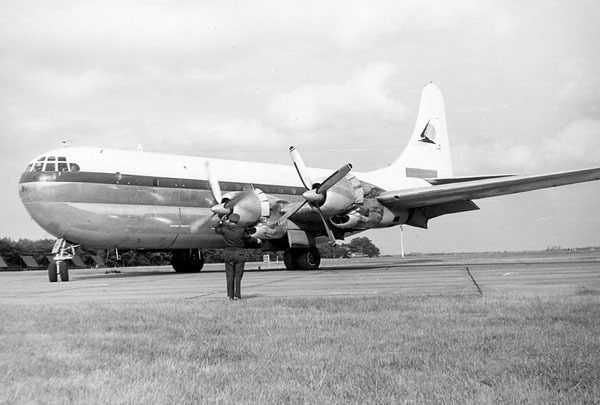 In the early 1960's, the IAF realised a need for a larger transport aircraft then the Douglas C-47's and Nord N2501 Noratlas, one which could lift larger payloads over longer distances and which also would be able to deliver goods through the use of air drops. The IAF was keen on obtaining the Lockheed C-130 Hercules. This airplane was too expensive. Besides, the United States refused to sell the Hercules to Israel in the light of the arms embargo, as it was considered a strategic military asset. Around the same time Israeli Aircraft Industries at Ben Gurion International Airport, had two privately owned Boeing 377 Stratocruisers for overhaul. According to some sources, IAI (Israeli Aircraft Industries) became the owner of these aircraft, after the initial owner went bankrupt. IAI made the offer to modify the Stratocruiser to the transport needs of the IAF. The IAF however wasn't interested at first but through some serious lobbying IAI managed to acquire enough support in the Israeli Ministry of Defense that a decision was made in favour of buying the Stratocruisers. The planes were bought at bargain prices from the large storage facilities in the state of Arizona (USA). The planes were overhauled at IAI and were modified from luxury airliners to military transports. Modifications included a stronger cabin floor and a mechanical installation in the fuselage to allow the handling of cargo. The original tail section was substituted for a C-97 military Statocruiser tail section, which included a clam shell cargo door. The first Starocruisers, called Anak (or Giant in Hebrew) joined the IAF ranks on the 1 st of July 1964. In all a total of ten IAI converted Boeing 377 Starocruisers (the civilian version) were delivered. Three of these were modified by the use of a swing tail section, in order to airlift outsized cargo. On the ground, while the aircraft was static, the tail section could be swung aside, and large goods could be taken on in the spacious hull without the restrictions of the comparatively small clam shell doors. This mechanism was copied from the Canadair CL44D-4 airliner. Three 377's were ‘standard' IAI modifications as mentioned above, while two others were later modified as aerial tankers with hosereel refuelling pods under the outer wings, the same pods as used on the Mc Donnel Douglas A-4E/ A-4H and A-4N “Ahit” (vulture) models. Another two were modified as ELINT-platforms. Packed with electronic wizardry, they were able to perform electronic reconnaissance, surveillance and ECM-missions (ECM-Electronic Counter Measures). 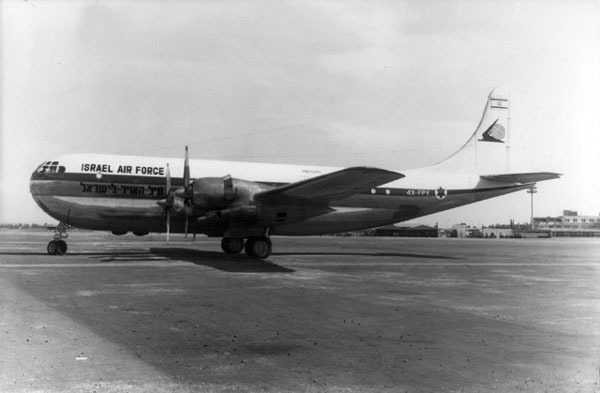 After the Six Day War, around 1968, four KC-97G's were obtained from US surplus to enhance Israel's airlift capability. These aircraft can be distinguished from the previous aircraft by the square fuselage windows and were equipped with the flying boom system, which gave the IAF the ability to refuel the F-4E Kurnass mid-air. This system served as the basis for the IAI flying boom system, later perfected by IAI and adopted on the IAF Boeing 707 fleet. The bulk of the Anak's missions that were flown involved collecting various goods from overseas, maintaining vital air links and keeping the IDF's warehouses filled. During the 1967 Six Day War for instance, at least two aircraft flew to Gilze-Rijen Air Base in the Netherlands, to collect spare parts and ammunition. The Anak's were also involved in replenishment missions of the troops in the Sinai-desert. On September 17th 1971, one of the two ELINT Stratocruisers was shot down by an Egyptian SA-2 missile while on an electronic surveillance mission along the Suez Canal. Seven of the crew of eight perished, the only survivor being Major H.Gazit. As the Yom Kippur War in 1973 broke out, the IAF had ten serviceable Stratocruisers on its order of battle. As in the 1967 war they were used on a wide scope of transport missions, i.e. 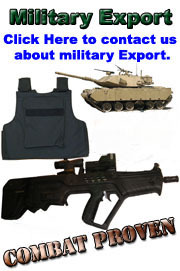 collecting supplies from Europe and replenishing the Israeli troops in Africa, flying from Fahid Air Base in Egypt. During their service career in the IAF the Stratocruisers wore both civil and military registration. In 1978, the last Stratocruisers were withdrawn from IAF service, having proven IAI's concept as well as their usefulness more than adequately.